This article is about the Ziegfeld Follies Broadway shows. For the film, see Ziegfeld Follies (film). Inspired by the Folies Bergère of Paris, the Ziegfeld Follies were conceived and mounted by Florenz Ziegfeld Jr., reportedly at the suggestion of his then-wife, the entertainer Anna Held. The shows' producers were turn-of-the-twentieth-century producing titans Klaw & Erlanger. The Follies were a series of lavish revues, something between later Broadway shows and the more elaborate high class Vaudeville variety show. The first Follies was produced in 1907 at the roof theatre Jardin de Paris. During the Follies era, many of the top entertainers, including W. C. Fields, Eddie Cantor, Josephine Baker, Fanny Brice, Ann Pennington, Bert Williams, Eva Tanguay, Bob Hope, Will Rogers, Ruth Etting, Ray Bolger, Helen Morgan, Louise Brooks, Marilyn Miller, Ed Wynn, Gilda Gray, Nora Bayes and Sophie Tucker appeared in the shows. The Ziegfeld Follies were also famous for their display of many beautiful chorus girls, commonly known as Ziegfeld girls, who "paraded up and down flights of stairs as anything from birds to battleships." They usually wore elaborate costumes by designers such as Erté, Lady Duff Gordon and Ben Ali Haggin. The "Tableau vivants" were designed by Ben Ali Haggin from 1917 to 1925. Joseph Urban was the scenic designer for the Follies shows starting in 1915. 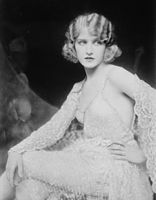 After Ziegfeld's death his widow, actress Billie Burke, authorized use of his name for Ziegfeld Follies in 1934 and 1936 to Jake Shubert, who then produced the Follies. 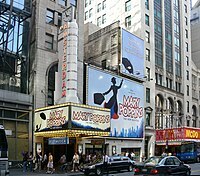 The name was later used by other promoters in New York City, Philadelphia, and again on Broadway, with less connection to the original Follies. These later efforts failed miserably. When the show toured, the 1934 edition was recorded in its entirety, from the Overture to Play-out music, on a series of 78 rpm discs, which were edited by the record producer David Cunard to form an album of the highlights of the production and which was released as a Compact Disc in 1997. In 1937, at the 9th Academy Awards, the Metro-Goldwyn-Mayer film, The Great Ziegfeld produced the previous year won the Best Picture, starring William Powell as the master showman and co-starring Myrna Loy (as Ziegfeld's second wife Billie Burke), Luise Rainer (as Anna Held, which won her an Academy Award for Best Actress), and Frank Morgan. Featuring numbers by Ray Bolger, Dennis Morgan, Virginia Bruce, and Harriet Hoctor, the film gave a glimpse into what the Follies were really like. The MGM blockbuster's show-stopper was the Irving Berlin-composed "A Pretty Girl Is Like a Melody", which, by itself, cost more to produce than one of Ziegfeld's entire stage shows. In 1941 MGM released Ziegfeld Girl, starring Judy Garland, Lana Turner, Hedy Lamarr, James Stewart and Tony Martin which was set in the 1920s. Celebrated numbers from Ziegfeld Revues were recreated, including the famed "Wedding Cake" set which had been used for Metro's earlier film, The Great Ziegfeld. Charles Winninger, who had performed in the Follies of 1920, appeared as "Ed Gallagher" with Gallagher's real-life partner, Al Shean to recreate the duo's famous song "Mister Gallagher and Mister Shean", originally part of the Follies of 1922. 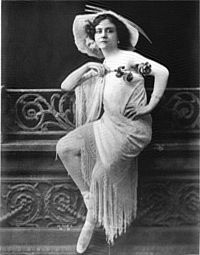 According to modern sources, Turner's character was modeled after Ziegfeld Girl Lillian Lorraine, who suffered a drunken fall into the orchestra pit during an extravagant number. In 1946 MGM released a third feature motion picture, that was entered into the Cannes Film Festival, based on Ziegfeld's shows entitled Ziegfeld Follies with Fred Astaire, Judy Garland, Lena Horne, William Powell, Gene Kelly, Fanny Brice, Red Skelton, Esther Williams, Cyd Charisse, Lucille Ball, Kathryn Grayson, and others performing songs and sketches similar to those from the original Follies. Brice appeared in the Follies for more than ten years. The 1964 musical, Funny Girl, starring Barbra Streisand as Fanny Brice, depicts Brice's success with the Follies. The 1968 Columbia film of the musical also starred Barbra Streisand as Brice and Walter Pidgeon as Florenz Ziegfeld. One of the hits of the 1908 Follies, created by husband-and-wife team (and Ziegfeld performers) Jack Norworth and Nora Bayes. This recording was made a year later by Ada Jones and Billy Murray. A photograph of Doris Eaton Travis (1904-2010) in about 1920, during the Ziegfeld Follies years. The 1912 version of the Ziegfeld Follies included a song entitled Row, Row, Row, which has been adapted by two football clubs in two different codes[clarification needed] as its club song. In 1962, cabaret singer Jack Malcolmson, who was performing at the Richmond Football Club (Australian rules) Social Club in Richmond, Melbourne, adapted the song into the Tigers' new club song, We're From Tigerland, at the request of Richmond committee member Alf Barnett. (Previously, Richmond's club song had been Onward The Tigers, to the tune of Waltzing Matilda.) In 2014, Melbourne's Herald Sun ranked We're From Tigerland as the best club song of any Australian Football League team. Official versions of the song include a 1972 recording by the Fable Singers, who recorded most AFL club songs, and a 2018 recording including Richmond legends Matthew Richardson and Kevin Bartlett. Row, Row, Row has also been adapted by America Football Club in Rio de Janeiro as its anthem, the Hino do America, with America supporter and famous Brazilian composer Lamartine Babo helping adapt the song. The 1971 Stephen Sondheim musical Follies takes place at a reunion of showgirls from the Weissman Follies, a fictional revue inspired by the Ziegfeld Follies. In addition to featuring "ghosts" of statuesque showgirls from the heyday of the revues, the musical includes many songs and production numbers that are intended to evoke the types of entertainment typically featured in the Ziegfeld Follies and other revues of the period. Examples include parade of showgirls ("Beautiful Girls"); a torch song (Losing My Mind); a baggy pants comic song ("The God-Why-Don't-You-Love-Me Blues"); and a novelty song ("Rain on the Roof"). In The Drowsy Chaperone there is a character by the name of Victor Feldzieg, the producer of Feldzieg's Follies, a parody of Ziegfeld Follies. ^ The Ziegfeld Girl entry, AFI Catalog of Feature Films, 1941-1950; accessed October 2, 2016. ^ League, The Broadway. "Funny Girl | IBDB: The official source for Broadway Information". www.ibdb.com. Retrieved 2016-04-21. ^ Massa, Steve (2013). Lame Brains & Lunatics: The Good, the Bad, and the Forgotton of Silent Comedy. Albany, Georgia: BearManor Media. pp. 88–91. ISBN 1-59393-268-5. ^ "William E. Ritchie, Trick Bicyclist, 70?. Vaudeville and Revue Artist Dies Here. Had Played With Will Rogers, W. C. Fields. In Stage Team with Wife. He and May Villion on Tour for Many Years. Were in 'The Follies' of 1917–1918". New York Times. May 13, 1943. ^ "Every AFL song ranked from best to worst". Retrieved 2017-09-30. 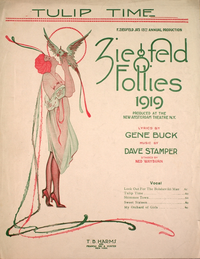 Wikimedia Commons has media related to Ziegfeld Follies.